Fishing has a historical presence up the Gunflint Trail, and Rockwood Lodge is located in the heart of some of the best fishing the entire region has to offer. From our shores on Poplar Lake there is consistent walleye, pike and smallmouth action. Pike over 30 inches, smallmouth in the 18-20 inch range and a stringer of walleye were all common reports during recent years, including a 38-inch pike caught in 2015 from Poplar Lake by a guest at Rockwood. However, fishing Poplar is just the start. Lake trout are abundant in a variety of lakes located within just a few miles of Rockwood Lodge. The best time to catch Lakers is early in the season. When you arrive at Rockwood, we are always spot-on for where the action is hot and will point you in the right direction. Walleye fishing is always a hot topic around the Lodge, and there are several lakes in the Poplar area recognized as some of the best walleye fisheries along the Middle Gunflint. 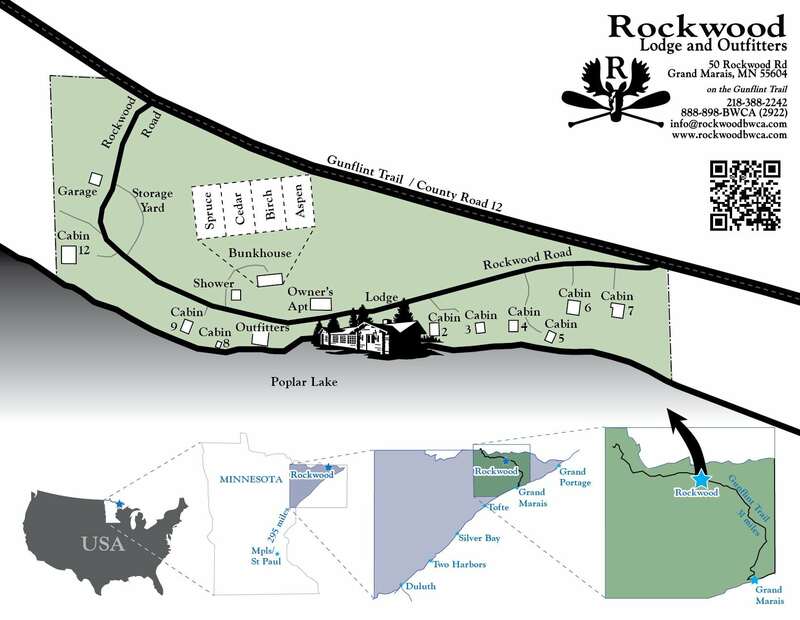 As an added bonus, these lakes can be reached by portaging from Poplar, meaning you don’t have to drive your car once you get to Rockwood in order to catch trophy walleye! Fishing hotspots vary depending on the time of year you visit, but we know where and when the walleye bite is strong on a year-round basis and are glad to provide direction. In addition to lake trout, there are an abundance of rainbows, splake and brown trout that can be caught within just a few miles of Rockwood Lodge. Either with a fly rod or spinner, the trout in these parts are aggressive and large. It is not uncommon to see an 18-inch brown trout or 15+-inch rainbow make their way to our fish house. We have fishermen and women of all ages and experience visit our Lodge, and there is a good time waiting for anyone who puts a rod and reel in their hand when they visit Rockwood. We also sell leeches and nightcrawlers at our outfitting post, so it’s easy to be prepared for whatever the fish are biting on.